It’s Spring and new growth abounds. 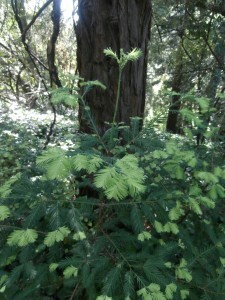 This redwood tree is probably over a hundred years old—yet look at the tender young leaves it’s sending out into the world as an affirmation of life ongoing. It’s Spring and the weather is lovely, there’s plenty of light, and all around us we see plant and animal life renewing itself. It’s the perfect time to shake off the physical and emotional contraction that often accompanies Winter. In Spring, the natural cycle of life supports us to get outside, breathe deeply in the natural world and get physically active. Take advantage of this seasonal timing to begin or resume your walks, runs, swims or whatever else moves you and gets your moving. Remember that no matter how old or out of shape you may be, you can always develop new habits, grow new muscle, and build new neural pathways that support life-giving practices. Get in the habit now, while it’s easy, so that when the weather changes, and it’s dark and rainy, you won’t be daunted. You’ll have walked so many times on say, Saturday afternoon, that your body expects it, your body wants it, and your body will help you overcome mental resistance to do it! There really is no time like the present. So let’s get started. Schedule a Wellness Walk with me. Or plan a hike with a friend, walk at lunch with a coworker, explore your neighborhood solo—anything—just get out there and move your body. Do it now, while the winds of Spring are here to fill your sails.